Bukster Freeware Games - No nonsense and ready to download now! 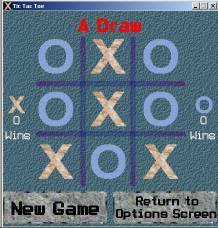 All games on this website are designed for use with PC compatable computers. These games are all freeware and are programmed purely as a hobby. Use of these games is subject to our standard disclaimer. Click here to read them. Contact me here if you have any problems running these games or any questions about them. Some of these games have been independently reviewed and rated by Brothersoft.com and alltheshareware.com. Look for the and symbols. ZX81 Berzerk: A ZX81 conversion of the 1980 arcade game from Stern Electronics. Features much the same game feel as the original game. Shoot the robots yourself or use the original game strategies of tricking robots into shooting one another or get Evil Otto to kill them for you. The ZX81 may not be able to create the speech found on the original game, but a scrolling text at the bottom of the screen lets you know how you are doing. If you leave any robots alive when you exit the stage, you will be reminded to not be a chicken and fight like a robot. Click on the links below to download either an emulator file (.p format) or an MP3 file if you wish to play this on an orignal machine. ZX81 Berzerk supports the Chroma interface. It will run on standard hardware, but if you use a Chroma interface, the game will play in color. ZX81 Jetpac: Inspired by the 1983 Spectrum game, this has the same game play including four types of alien and two spaceships. Written entirely in machine code it has redefinable keys and four difficulty levels - features not found in the orignal game. Click on the links below to download either an emulator file (.p format) or an MP3 file if you wish to play this on an orignal machine. ZX81 JetPac now includes support for the Chroma interface. It will run on standard hardware, but if you use a Chroma interface, the game will play in color. ZX81 Masada Class Game: This is a prehistoric Bukster game from the 90's written for my first computer, a Sinclair ZX81. In this game you play the part of a Masada type robot battle craft. You were abandoned in space after a war in the 22nd century. now you are called back into action after an alien invasion. As usual for these sorts of games - you are Earth's last hope. Part of challenge for me was to see if I could make a decent game with only 16 kilobytes of memory. This game features 6 stages and in game messages. Early ZX81 games hardly ever had features like explosions when an enemy was hit or a pause function. I wanted to do something better. This game is available for free download. The download comes in .t81 format for use with ZX81 emulators that support it. By the standards of the games that came out when the ZX81 was a new system, this looks pretty good. However a number of other programmers have continued to produce games for the ZX81. Now that you have an emulator, be sure to check out some of their forums for games that make this look pretty lame. There are some very skilled people out there and I salute their efforts. The ZX81 was not an easy machine to program on. Gigantic - A program I wrote myself in Basic. Input a string and the ZX81 will convert it to large text and scroll the message repeatedly. It was intended as a possible shop display utility. Toad on the Road 1983 Griffon Software. Author details unknown. This game from a private publisher in New Zealand is a worthy Frogga clone not seen on the Internet previously. Robots on Terminus IV Antarctic Computing 1982. Another New Zealand software house not previously seen on the Internet. They also did a version of the popular Trek game which despite several attempts I have not been able to convert to emulator format. However, at least this effort can be saved. This adventure game uses the dot symbol in place of a space. Use commands like "Get Shoes" to obtain items or N,S,E,W,U or D to move. 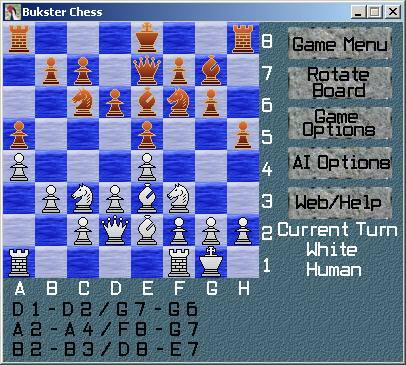 Bukster Chess version 7. The New AI is finally ready and uploaded. It is smarter and a lot faster than the old version. Play against the computer or another person. You can even make the AI play against itself Choose to play as black or white. You can take back moves, swap sides, get the computer to make a move for you and many other features. This is the only chess game written entirely in GML using Game Maker. Check back for updated versions. Click the screenshot or one of the download site buttons below to download. Hall of Shadows If you like maze games, then this is the game you have been waiting for. In this game you have to find the exit to a huge maze. Pick from four maze sizes and six monster difficulty levels. 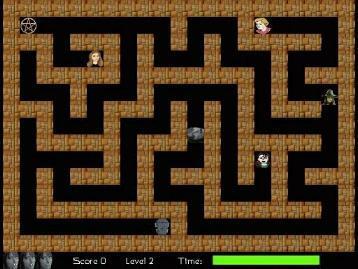 The mazes are generated by the computer, so every new game has a unique maze to solve. Save and load your games if you can't finish a game in one session. Fight monsters, pick up treasure, armor and health potions. Trade with the maze fairies for the things you will need to solve this maze. The smallest maze gives you a game you can play in five minutes, the largest would cover a wall in your house if you could see the whole of the maze at once. This screenshot has been shrunk and cropped check out the screenshots page to see full size screenshots, maps and views of the game. Have a free clock or screensaver starring one of your favourite celebrities. Eyes move in time with the pendulum. Choose from George Bush, Steve Irwin, Britney Spears, Shania Twain and others. Now includes a non-celebrity screensaver with the ability to countdown to a time and date of your choosing. Find out how long until the weekend, your wedding or whatever. 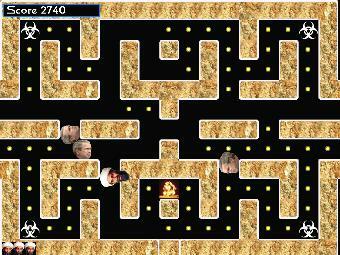 Osama Bin Laden, Steve Irwin, Brooke Fraser and Shania Twain turn into Pacman parodies on this page. Help Osama escape the world leaders, Brooke beat the Devil, Shania escape an outlaw or help an angry crocodile bite Steve Irwin and escape Australia Zoo. Download a Mastermind style code cracking game or play an evil vampire in Vampire Maze. Steve Irwin Games. There are two Crocodile Hunter items available, a Pacman Style game or a desk clock or screensaver featuring the late Steve Irwin. Click on the picture to go to the Steve Irwin game page. On a totally different subject, this page doesn't have any games. This is a photo album from a forest next to my house in New Zealand. So every time I go for a walk in it, these are the sort of things I meet. Check out the freshwater crayfish (koura) from a nearby stream. 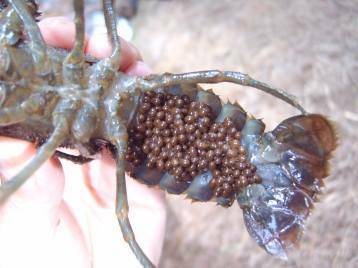 Now includes a whole page of photos of some crayfish with eggs and young on their undersides. There is also a page with some short Youtube movies showing the crayfish in action. 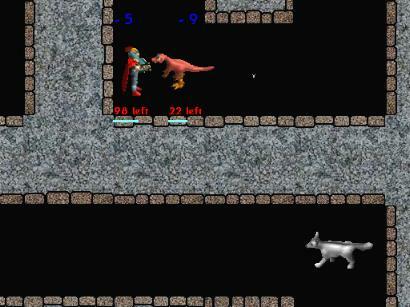 If you like these games, check out these sites for great freeware games and more.